It’s been such fun weather here in Toronto eh? Some days, the biggest parks in the city welcome throngs of visitors with the blooming Sakuras whereas other days we are back to full-on winter attire. But today, today I am soaking wet. Like I mentioned in my last post, I have been extremely busy lately running around the city. This crazy rain we’re having makes it all the more challenging. It’s only Monday and I already have the need for an all-day-long caffeine infusion. Let’s just say that its not even afternoon coffee time yet and I’ve already had my usual 16oz. during ballet class and a small latte at a meeting with a client. For the first time since I’ve started writing this blog I had a bunch of friends coming with me to a coffee shop. This can only mean one thing; more drinks to try! They have different kinds of maps printed on their tables, pictures of actual customers traveling the world and a bookshelf full of travel guides. A countertop decorated with climbing robes gives the final touch. I can’t forget to mention the beautifully fit climbers scaling walls only a few feet away. One can only dream about seeing the world while coffee-ing here. While Basecamp and Black Rock coffee are not totally related. Their owners are. The cleverly designed logo of the coffee shop is actually the climbing gym logo upside down. Funnily enough, it resembles a pour over coffee maker. Also, somewhat related with the project is Parkbus, an amazing company specializing in short bus trips to beautiful destinations within the province. At around 4pm we arrived at this extremely cute coffee shop. Located in the middle of Koreatown and conveniently close to Christie Pits (they have outdoor movies in the park in summer!) there is Black Rock Coffee. Remember those big windows for people-watching that I talk about all the time? Well, this coffee shop has its own unique version of this. Instead of facing the sidewalk, these windows face the establishment next door. And instead of watching people walk by in the rain (though there are also windows on the other side where you can do just that) these particular windows face a rock climbing gym. Who would have thought that extreme sports and coffee would make such a good match? Obviously, whoever thought this up nailed it big time! With backpackers and world-trotter vibe going on, this coffee shop is the best place to get some inspiration while planning your next adventure. We ended up having a wide variety of drinks: a Cappuccino, a cortado, a latte and chai latte. 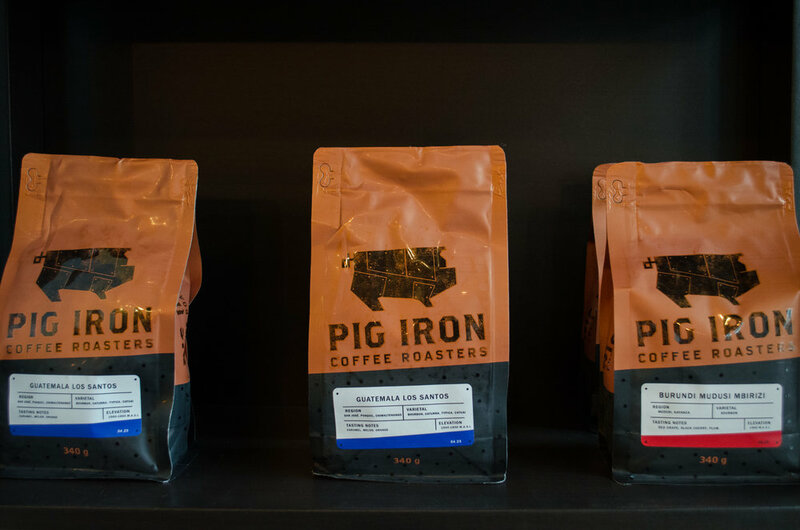 They were all made with beans from Pig Iron Coffee Roasters (excepting the Chai of course), a Mississauga based roastery. My favourite one was the latte my friend was having. It was just as smooth and soft as it should be. The cortado and cappuccino were a bit tart but that actually paired perfectly with the chocolate-coconut macaroon we ordered. I made the huge mistake by not ordering their black sesame latte. Last time I was here, my friend ordered it and it was delicious. The Chai I did try this time was also a delicious blend brought to your cup from Bampot Bohemian Tea House. Their lose leaf tea selection is among the widest you can find in the city. After a month and a half of writing this blog I have come to a conclusion. Coffee is the key that holds every coffee shop together, but the atmosphere is by far the most important element of a successful coffee shop. The cohesiveness of the decor, the qualified friendly staff and the drinks are what makes a coffee shop stand out. Black Rock Coffee put us all in a good frame of mind and got us and ready to go back out and brave the rain again. It’s been a lovely week after this coffee encounter and I hope that you all stay tuned for the next adventure. Until then!